balance for the immune system. Restorative balance for the immune system. MSMPure™ is a premium supplement compound that supports a healthy immune system through its relationship with glutathione, a key antioxidant in the body. As a concentrated source of dietary sulfur, MSMPure™ supports the immune system by promoting healthy metabolic functions and reducing oxidative damage. MSM contains concentrated levels of sulfur that are essential for glutathione production, a key antioxidant in the body. As we age, our bodies sulfur levels decline, creating deficiency’s of this essential mineral for the immune system. MSMPure™ helps to restore this back to optimal levels. It is widely accepted that the amount of available sulfur in cropland is declining for a number of reasons. In addition, cooking or food processing can limit it availability. This means most people do not get enough sulfur in their diet for optimal health. 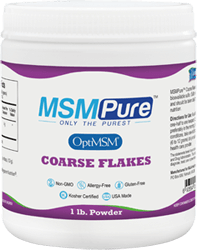 MSMPure™ can help replenish the intake of dietary sulfur to support a healthy immunity. Cellular regeneration and permeability play a critical role in a strong and balanced immune system. Sulfur-containing MSMPure™ helps support this process. Concentrated levels of sulfur found in MSMPure™ are critical for the production of glutathione, which serves as an anti-oxidant, detoxifier and immune system enhancer.